A group of violent Turkish migrants have filmed themselves ‘terrorising a neighbourhood’ and bragging about their behaviour online. 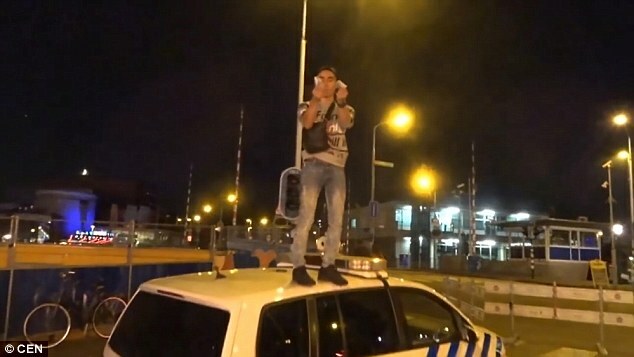 The group, from Zaandam in the Netherlands, are said to have been intimidating police officers, jumping on police cars and beating up a bicyclist. The group’s 19-year-old leader Ismail Ilgun was arrested this morning, according to Telegraaf. n his latest video, Ilgun said: ‘Who the f*** are all you racists? Even Dutch PM Mark Rutte, 49, felt the need to respond to the local crisis in Zaandam. She said her house had been bombarded with eggs and at times they were waiting for her on the pavement. Some of Rot’s colleagues took the side of the migrant group. Local Socialist Party leader Patrick Zoomermeijer said the youngsters were ‘unpolished diamonds’. The group appeared on a primetime talk show sparking a nationwide debate.